When you consider that Chelsea waited 27 years to win the Cup after lifting it for the first time in 1970, their recent record in the competition has been spectacular. Since Wembley was relaunched, Chelsea have been in four of six finals. To coin a phrase used by Liverpool fans in their hey-day, it’s become “headquarters”. Roberto Di Matteo, now Chelsea’s caretaker manager, has had a love affair with Wembley, albeit the old twin-towered version. He scored the fastest ever final goal in 1997 – some 42 seconds – and also netted the winner in 2000. Add to that his goal for Chelsea in the Football League Cup final in 1998 and you can understand why he must be relishing a return to a fertile hunting ground. 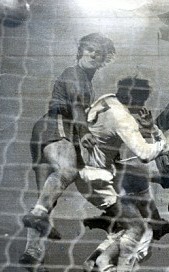 Chelsea’s first FA Cup triumph, in 1970, was an epic encounter that anyone witnessing it will never forget. The Blues beat Leeds over two games, much against the odds, beating a multi-talented team of internationals. In some ways, they were battered in the way Barcelona were supposed to win in the Champions League. Few people would have predicted that it would take a generation to win the famous silver trophy again. In recent finals, Chelsea have disposed of Manchester United (1-0), Everton (2-1) and Portsmouth (1-0), none of which have been remotely as interesting as that 1970 final. Didier Drogba scored in all three of those victories. Chelsea’s last proper defeat in the FA Cup was on March 8 2008 when they were beaten in the sixth round by Barnsley. Since then, they won the cup in 2009 and 2010 and went out on penalties to Everton in 2011. That is the measure of their dominance of the competition in recent years. 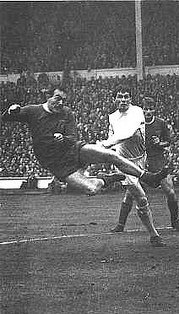 Ian St.John heads home the winner in the 1965 final – beating those ever so popular bridesmaids Leeds. Liverpool last won the FA Cup in 2006 in an exciting final against West Ham, although the decider was on penalties. It is a defeat that still rankles with Hammers’ fans. The Reds’ best spell was between 1986 and 1992 when they reached the final four times, winning three. Two of those victories were in all-scouse finals, beating Everton in 1986 (3-1) and 1989 (3-2), the latter tarnished by the Hillsborough disaster. Liverpool have tasted Wembley glory this season, huffing and puffing their way past Cardiff City in the Football League Cup final. Chelsea will be a bit tougher for them, but then Liverpool will be a damn sight harder than the last FA Cup final opponent the Blues faced. Previous Entry Hodgson’s choice – Hawthorns or Crown of Thorns?